The most comprehensive study on the parameters of primordial Karate, this work intrigues readers with rich detail and insights into these ancient combat traditions, the pride of Okinawa. 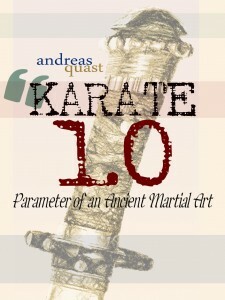 KARATE 1.0: Parameter of an Ancient Martial Art. Düsseldorf 2013, by Andreas Quast. Hardcover binding in green linen material with gold foil stamping, size 8.25″ x 10.75″ (20.95cm x 27.31cm). Full-color dust jacket in matte finish. Inside: black and white printing on cream archival paper (60# weight). White exterior paper (80# weight). Forewords by Patrick McCarthy, Miguel Da Luz, Cezar Borkowski, Jesse Enkamp, Dr. Julian Braun, Soke Leif Hermansson, and Dr. phil. Heiko Bittmann. All copies ship from the United States. Okinawa was formerly known as the Ryūkyū Kingdom. This island kingdom was situated between China and Japan, the two giants in the ancient Asian world order. Involved for centuries in maritime trade, tribute, diplomacy and war, it became variously known as the peaceful kingdom, the islands of longevity, and the land of propriety. Over the course of five centuries, within its encapsulated maritime sphere, unique forms of martial traditions emerged. Today these are known as Karate and Kobudō – and many other names – the pride of the Okinawans, and world martial arts enjoyed by millions of people around the globe. Karate 1.0 was also covered in the Okinawa Karate News 沖縄空手通信, No. 91, 2014/01 issue. The university libraries of Ludwig-Maximilians-University in Munich as well as of the world’s largest sports university – the German Sport University Cologne – added copies of Karate 1.0 to their inventory. Yet, to this day factual details about the ancient and early modern history of these martial traditions haven’t been researched in detail. As the result of the author’s exclusive and trailblazing research, which started two decades ago with a white belt at a friend’s dōjō, KARATE 1.0 now bears witness to the myriad headwaters of modern day Karate and Kobudō. By conducting interviews around the globe and two years in Okinawa itself, sifting through mountains of primary and secondary research, he puts the fighting arts and related-persons into a new historical perspective. Karate 1.0 sold worldwide to Okinawa, Japan, the US, Canada, Australia, New Zealand, Tasmania, Ireland, the UK, Germany, Spain, Belgium, Austria, France, the Netherlands, Italy, Sweden, Norway, Denmark, Switzerland, and Spain. The central theme of this work is the search for causal triggers of a holistic system of unarmed and armed martial traditions. By analysing the origin and transformation of the military and security organization of the Ryūkyū Kingdom, the author identified the superordinate security related royal government organizations and functions responsible. In this way he detected hundreds of the real martial artists active during Okinawa’s old kingdom era who otherwise would have remained unnoticed both in Karate research and in oral tradition. In this way describing the enigmatic parameters of the Ryūkyū Kingdom’s ancient fighting arts, or KARATE 1.0, a common historical basis of the countless fragmentary traditions of modern Karate and Kobudō has been discovered. The sword hilt on the front cover is a scetch of the Chōganemaru sword. It once belonged to the mysterious King of Nakijin, Han’anchi. He was defeated by Shō Hashi, who took the sword. Afterwards it had been handed down within the royal Shō family of Ryūkyu for six centuries. On the cover it is meant as a symbol of royal authority rather than a weapon. Did you know: Karate 1.0 for the first time includes ALL accepted written historical sources on Karate and Kobudō related martial arts of the kingdom. It is also emblematic for the foreign influences. And it stands for the “Ryukyu Nutshell” in which the martial arts emerged, developed, and countinuously were updated. The “Ryukyu Nutshell” is the idea that the royal government of Ryūkyu basically remained in a constant form since the era of Shō Shin, although adjustments were taken over the centuries. 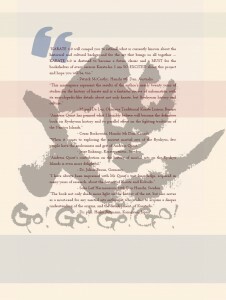 On the back cover is an artistic drawing of the character dō, i.e. the moral principle of justice, duty, and truth as the very basis of a martial “path”. Added to it is the caption “Go! Go! Go! Go!”. This is an allusion to the fact that the path should be proactively walked. BTW, dō is not the aim, but kokoro is. Finally, on the cover flips are found the characters Bun and Bu, that is, scholarship and the art of war, considered to have existed in unitas. The reason for this is that in feudal times civil and military questions were deeply associated. This can be seen in the Sappōshi missions from China to Ryūkyū. It can also be seen in the era of Satsuma control. And it was also manifest in the government organization of the Ryūkyū Kingdom. It is the first time these backgrounds had been described on the grounds of actual history. 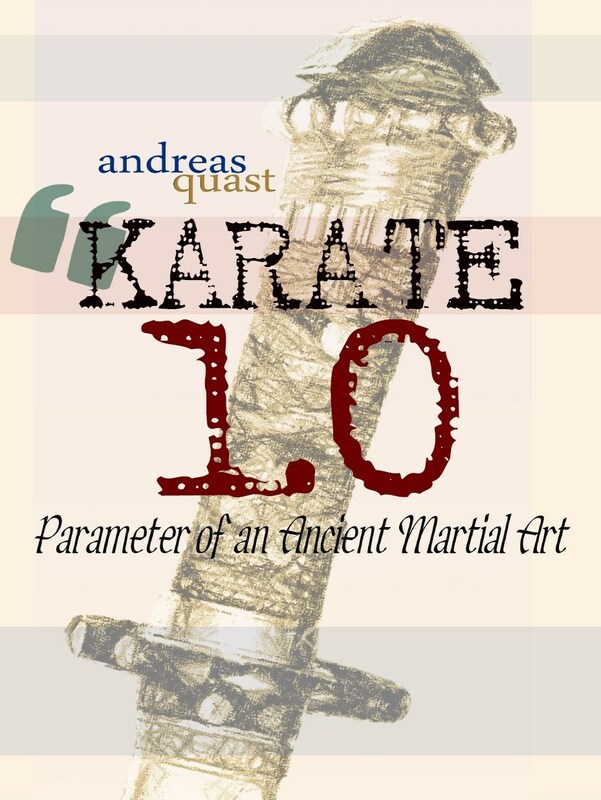 This entry was posted in Publications and tagged book by Andreas Quast, Buch von Andreas Quast, Karate, KARATE 1.0, Kobudo, Okinawa, Parameter of an Ancient Martial Art. Bookmark the permalink.